Hopefully you’ve had a positive trading week! There will be no weekend report this week. The writers are off this week and are hopefully getting much deserved rest. The stock charts are being diligently updated as time allows. Also, I’m interested in everyone’s input on what could be done going forward. Anything from layout to design, ease of comment reading, potential guest reports, as well as things that might not have crossed my mind yet for the blog moving into the future. Please comment below any suggestions. We’ve had quite a number of new students graduate into the OEW Group within the last few weeks as well as quite a few of them complete the course already and are now contributing great insights into stocks we’ve never looked into before. If you’d like to become a part of the OEW Group or learn OEW continue reading. If not happy trading! Over the past four years we have been compiling additional verified and quantified observations in the various markets. As a result, the 2019 lesson plan has been expanded to thirty lessons, with nearly all real time charts. Objective Elliott Wave, (OEW), is a quantitative approach to the Elliott Wave Theory. OEW is not textbook Elliott Wave. It is a proprietary technique that defines every significant wave within bull and bear markets quantitatively. All markets are driven by long term investor confidence cycles. When the cycle is positive a bull market unfolds, when negative a bear market. The OEW technique not only determines if a market is bullish or bearish, it also determines how far a market has progressed in its current cycle. Once you learn OEW you will be able to quantitatively research the historical price performance of any asset class, or stock, and determine its current position within its overall long-term trend. Quantified waves never change. Then using shorter term charts, you will be able to determine good entry and exit price areas in the asset you are tracking. It is not complicated. Actually, you will be amazed, after some period of time and dedicated study, how easily you will be able to discern the waves as they unfold. OEW quantitatively identifies all the medium, and long-term waves that create bull and bear markets. Every one! We have been applying this technique, successfully, for nearly 40 years. Over the years OEW analysis has led to some important projections in just the stock market alone. We projected the 1987 top and subsequent crash, called the Dec. 1987 low, the July 1990 top to the day, the 2000 top, the Oct. 2002 low, the Oct. 2007 top (in early Jan08), the Mar. 2009 bear market low nearly to the day, the 2016-2018 bull market (in mid-2016), and the recent bull market top in 2018. If you are interested in learning how to do this type of analysis yourself, and joining our private OEW group, just contact me at JohnsonOEW@gmail.com for details. Best to your trading/investing. Wags, that news story was first posted at 5:41 AM Friday morning and up until then bonds had been declining overnight. Bonds bottomed on the initial take on the jobs number at 8:30AM then rallied SHARPLY on the 2nd glance at the hourly wages component of the release. The updated version of the news story at 9:08 AM should have corrected this headline as they were flat at that time. Bond futures finished the day in the green with the 30 year + 0.21% and 10 year + 0.05% from the Thursday close and both up dramatically from the 8:30AM lows. no matter what the news was…. My close personal friend Colin Twiggs sent this to me. He says no sign of a recession. Could a conventional take of the ASX 200 be of any use?.. Phil, why did you post earlier today that both stocks and bonds rallied? That couldnt be further from the truth. For someone that claims to be such a successful trader and following so many markets (with many posts about easy money being made in bonds), I’m seriously beginning to genuinely question your “bravado” given some terribly wrong claims that you’ve recently made here. see how this works now ? Actually, the only thing your post shows is that you have zero understanding of how the market works. I realize that you’re just a scalper who is only concerned with what the market may do in the next 5 minutes, but the professionals who trade and invest the $23 trillion of market cap are always looking 6 to 9 months out into the future. They do that by analyzing fundamentals and taking heed of Fed policy. Powell later said that QT was on “auto-pilot.” So, what did “auto-pilot” mean? It meant that all systems were “go” for the Fed to continue to roll-off assets until the balance sheet was reduced to $2.5 trillion. That meant that QT would be continuing for at least another 30 months. So, the chart you posted has nothing to with what the market has done, because it doesn’t show what Powell said on 10/3 and it doesn’t show what he said on 1/4. Yes, everyone who reads this blog knows that you repeat ad nauseam that the Fed is irrelevant to your 5 minute scalps, but the Fed is the most important factor of all to the people who invest the other $23 trillion in the market. It’s impossible to dispute the fact that the 20% decline that began on 10/3/18, and the subsequent 18% rally that began on 1/4/19, were 100% due to what Powell said on those 2 days. Michael, I’m just curious where your market perspective is now. Are you still somewhat bearish or has anything in the market changed your perspective as of late. You may have posted recently and I may have missed it. I know you had been dipping in and out of shorts the last few months. market, I haven’t posted in a couple of weeks. Been busy, plus I lost interest in this blog because it’s become nothing more than a daytraders’ chat room. I’ll try to post something before Monday’s open. I wasnt going to waste any time pointing out the obvious. For someone who claims no interest in Fundamentals and says that the FED doesnt matter….only to post a chart of a melt-up in stocks during the FED’s QT, is beyond any logical thought or comprehension. B.) QT will end in September. C.) QT will taper in May. None of those things would cause portfolio managers to aggressively buy equities. aah, tom and wags, better question is how do we get out of this vicious cycle? we keep backing ourselves into a corner. can’t raise rates because stocks will go down 20-40% so FED keeps pumping up stocks. yet usa has run up $1 trillion deficits for 10 years. Will bond holders eventually demand higher rates for the $22+ trillion of debt? if rates on 10 year ever go to 5 – 6%, we are in trouble. nearly half of tax revenue will be needed to just pay interest on the debt. That’s exactly what’s going to happen.. if anything I think the Fed will be disappointed that SPX is back at 2900 and possibly breaks even higher, this perma bid will be concerning to them I imagine. They just wanted to do enough to stop the rot. Sky high markets make it hard to justify easy policy and then the cycle starts over. These markets are broken in that weak economy equals higher stocks through looser policy. Stronger economy means lower stocks through tighter policy. It’s inevitable that investors will lose faith in central banks and then all hell breaks lose. Even if it doesn’t happen right now, it happens down the road because people have had enough of socialised markets which benefit the 1%. That’s why you’re getting all of these crazy ideas from people on the left around MMT and other stuff. I’d imagine that would be a vote winner as people at the bottom will feel they deserve something for free given the rich have been getting something for free… riskless asset markets. So things are going to be shaken up if they stay as they are, especially given the ratio of GDP capital receives relative to labour is at 100 year highs. mcg, i don’t get the new mentality from many so called finance experts (even buffett) that say gov’t debt levels don’t matter. If so, why haven’t we been running up more debt? ask people in Greece if debt matters. my guess is FED will keep rates low for decades. Look at Japan 30 years of rates at 0 or negative but can’t get any growth. Their Balance sheet has shed roughly $523 Billion since it started the QE unwind in October of 2017. The Fed’s balance sheet is back to where it was in mid-December of 2013 at $3.93 Trillion. But I wouldn’t try to claim that there is any kind of correlation between the Fed selling off Treasuries and Mortgages…. and a rally in stock prices. That would be pretty bizarre and literally make no sense at all. What has clearly caused this rally is a 180 degree change in Fed Policy since December 19th of last year…. when the S&P closed at 2507. 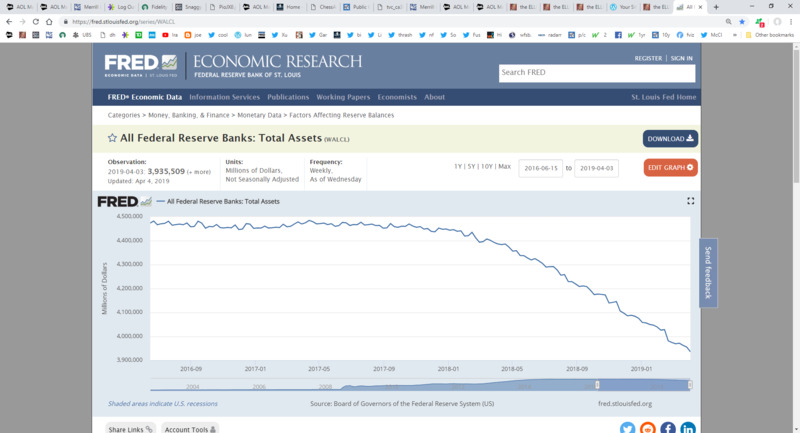 The FED doesn’t sell Treasuries to reduce their balance sheet. They buy less, as previous bonds expire. They simply “run-off” and mature.